NVMe has been a game changer for DBaaS, but it doesn’t come without its limitations. 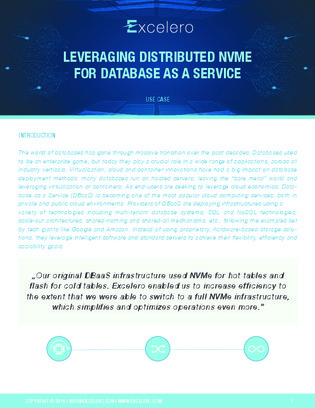 With NVMesh – deployed as a virtual distributed non-volatile array- providers of DBaaS can enjoy the full benefits of NVMe in a distributed fashion while meeting all their storage requirements. Download this resource to learn how your organization can benefit from NVMesh which enables true converged infrastructures by disaggregating storage from compute - giving IT full freedom in architectural design.